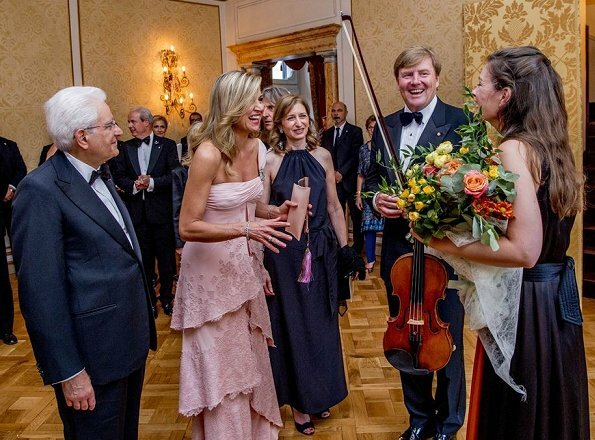 In the evening of June 21, King Willem-Alexander, Queen Maxima, Princess Christina (youngest sister of former Queen Beatrix), Prince Jaime, Princess Viktoria de Bourbon de Parme, President Mr. Sergio Mattarella and Mrs Laura Mattarella (Daughter of the President) attended a concert held at the Colonna Palace (Palazzo Colonna) in Rome, Italy. The concert took place by the Violinist Janine Jansen. I really like this dress but I think this is an unflattering photo. The lace edging is delightful. Not sure if others will find this look too bridal/bridesmaid. And love the jewels! I love the soft colour and the draped bodice but I'm a bit confused about what's happening with the lower part - multiple layers? I hadn't thought of it being bridal, although maybe there are hints of that, M Hall. But not in a bad way! The jewels are lovely - understated for Maxima, actually. But yes indeed, these delicate earrings are a nice change. I agree with you on the dress and the lovley soft colour. Ditto. Quite unlike Maxima, but very nice. 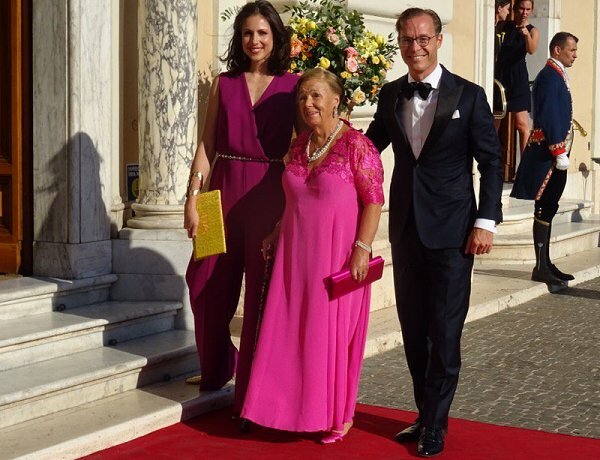 What a lovely dress -- and Maxima glows in it. She often goes for bold hues so this soft color on her is a nice change. I like the dress, is interesting although she needs a little more support in the top area. The President's daughter again has not chosen a good outfit, the pants are too short and it magnifies her hips, and what's that in the middle? a shiny heart? 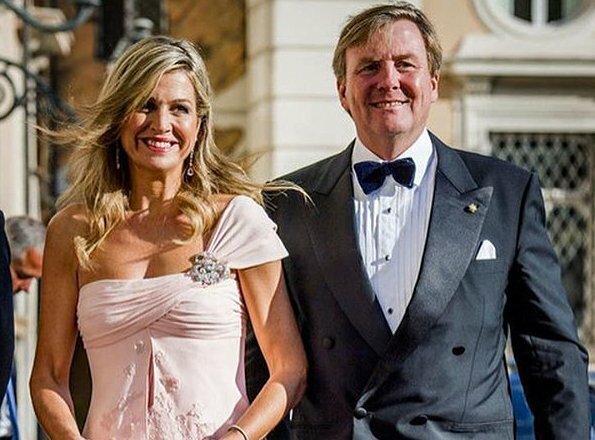 I think the president´s daughter is wearing a dress, but with the wind blowing quite hard, it almost looks like pants or a jumpsuit. The "shiny heart" is an unfortunate shadow pattern. I agree that the dress is not flattering on her - the totally wrong shape for her features. Photo #5 is new! Now the lower part is more visible. It's a beautiful dress. She looks lovely. I think the colour looks great on her and the make up and jewellery are just right. Even her hair looks OK with the soft curls at the end. I like this dress and it is still a lovely dress, however, I much preferred it is its original form, it was stunning then, the clean lines without the lace embellishment seemed fresher, crisper and more elegant - see the link above, so beautiful.